bytes of discrete and analog output data and the GE Versamax IC200GBI001 acts as controller for a set of I/O modules. IC693ACC340 Redundant Power Supply Base (RPSB) with 0.1 meter cable to connect to Power Supply Adapter module. Supports any Series 90-30 power supply. IC693ACC341 Redundant Power Supply Base with 0.5 meter cable to connect to Power Supply Adapter module. Supports any Series 90-30 power supply. IC693ACC350 Redundant Power Supply Adapter (RPSA) Module. The RPSA replaces the power supply on a CPU base or expansion base and connects to a Redundant Power Supply Base. IC693CPU360CA Series 90-30 CPU360 with Conformal Coated. 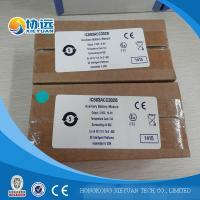 IC693CPU374CA Series 90-30 CPU374 Conformal Coated. IC693MDL660 24VDC Input Module 32 point. The module requires a terminal block (IC694TBB032 box style or IC694TBS032 springclamp style terminal block).Terminal block is sold seperately. IC693MDL754 12/24VDC Output (0.75 amps per point) Module 32 point. The module requires a terminal block (IC694TBB032 box style or IC694TBS032 spring clamp style terminal block). IC694MDL250 120 Vac Isolated Input (16 points). Module requires a terminal block IC694TBBx32 or IC693TBSx32). Only compatible with RX3i controllers. IC694MDL350 120/240 Vac Isolated Output, 2 Amp (16 Points). Module requires a terminal block (IC694TBBx32 or IC693TBSx32). Only compatible with RX3i controllers. IC694MDL660 RX3i 24VDC Input Module 32 point. Module is supported by serial bus andis not limited to the universal base or expansion base. The module requires a terminal block (IC694TBB032 box style or IC694TBS032 spring clamp style terminal block). IC694MDL754 12/24VDC Output (0.75 amps per point)Module 32 point. The module can be used on expansion bases (uses high speed serial bus). The module requires a terminal block (IC694TBB032 box style or IC694TBS032 spring clamp style terminal block). IC694PWR331 Power Supply 24 Vdc High Capacity. IC694TBS132 36 Point Terminal Block,spring clamp style extended depth shroud. Compatible with new high density I/O modules for both RX3i and Series 90-30. IC695ALG600 UNIVERSAL ANALOG MODULE. 8 CHANNELS OF ANALOG CONFIGURABLE FOR THERMOCOUPLE, RTD, RESISTIVE, CURRENT, OR VOLTAGE. 2 ISOLATED GROUPS, 4 CHANNELS PER GROUP Terminal block ordered seperately. IC695ALG608 Analog Input module, 8 channels single ended, 4 channels differential, channels are configurable for voltage and current. IC695ALG608CA Conformal Coated Analog Input Module, 8 Channel voltage/current. Module does not include terminal block. IC695ALG616 Analog Input module, 16 channels single ended, 8 channels differential, channels are configurable for voltage and current. Can be configured for Current: 0 to 20mA, 4 to 20mA, +/- 20mA; Voltage: +/- 10V, 0 to 10V, +/- 5V, 0 to 5V, 1 to 5V. IC695ALG616CA Conformal Coated Analog Input Module,16 channel voltage/current. Moduledoes not include terminal block. IC695ALG626 Analog Input HART module, 16 channels single ended, 8 channels differential,channels are configurable for voltage,current and current/ HART. IC695ALG628 Analog Input HART module, 8 channels single ended, 4 channels differential,channels are configurable for voltage,current and current/ HART. IC695ALG704 Analog Output Module, 4 channels,that is configurable for voltage and current, configured for Current: 0 to 20mA, 4 to 20mA; Voltage: +/- 10 VDC, 0 to 10VDC per channel non isolated. Up to 16 bit resolution. IC695ALG704CA Conformal Coated Analog Output Module,4 channel voltage/current. Moduledoes not include terminal block. IC695ALG708 Analog Output Module, 8 channels,that is configurable for voltage and current, configured for Current: 0 to 20mA, 4 to 20mA; Voltage: +/- 10 VDC, 0 to 10VDC per channel non isolated. Up to 16 bit resolution. IC695ALG708CA Conformal Coated Analog Output Module,8 channel voltage/current. Moduledoes not include terminal block. IC695CHS012CA RX3i 12 slot universal backplane. Conformal Coated. IC695CHS016CA RX3i 16 universal slots backplane with conformal coating. IC695DEM001 RX3i Demo Case: RX3i and simulator.Demo includes CPU, power supply, input simulator, output, high speed counter,analog, digital servo and universal analog module. Simulator includes analog meter, pot, encoder and LEDs. IC695ETM001CA RX3i Ethernet Mdl,10/100Mbits,Conformal Coated. IC695LRE001CA RX3i Local Serial Expansion Conformal Coated. IC695NKT001 RX3i Ethernet NIU Kit includes NIU (IC695NIU001) and Ethernet module (IC695ETM001). ENIU supports two serial ports and 20k of local logic. TheENIU must be installed in a IC695CHSxxx base. IC695PBS301 Profibus Slave module that supports V1 functionality. The Profibus Slave module utilizes the RX3i PCI bus and will only work on the RX3i Universal base. IC695PSA140 120/240VAC, 125VDC Multipurpose Power Supply is suitable for use in load-sharing and redundancy application. IC695PSD040CA RX3i 24VDC Power Supply, 40 Watt Conformal Coated. IC695PSD140 24VDC Multipurpose Power Supply is suitable for use in load-sharing and redundancy application. It must be installed in a PACsystems RX3i (IC695catalog number) Universal Backplane. PO 24 VDC IN 24VDC Outputs. 20 Point optional communication. 64 Point PLC Serial Port and optional communication port 24 VDC In 24 VDC source out. 64 Point PLC (40) 24 DVC Power Supply in relay out. Optional communication port. The Ethernet module is compatible with SRTP and supports up to 4 connections. 24VDC IN relay out 120V 240 AC power supply 14 point exp. 20/40/64 user program memory module. Micro Motion 2 Independent axis120/240VAC powered.